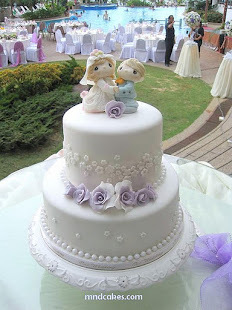 Mom And Daughter Cakes: Will You Marry Me? Ben decided to propose a marriage by using cupcakes. He went through a tough session to finalize the design. My task was just to realize his idea. I don't mind to be merely a workman as long as the client has a clear idea of what he/she wants. Again, our ever popular pair of hot red lips were chosen, hehe......and the inscription of "Will you marry me?" was stated. On that special day, Ben brought the cupcakes, roses and a ring to his girl friend and expected an answer anxiously. Did Ben succeed? With a wonderful preparation like this, the answer was definately a 'yes'.